Water is the most important emergency treatment given for anhydrous ammonia exposures before advanced medical services arrive. Anhydrous ammonia is hydrophilic which is to say it has a strong affinity for water. 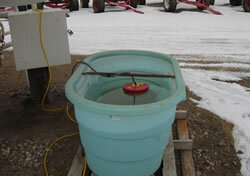 When anhydrous ammonia vapor or liquid comes in contact with water it forms the corrosive alkaline ammonium hydroxide. The human body consists of 70% water by weight. Our eyes and lungs contain much more water than this rendering our vision (eyes) and breathing (respiratory system) especially at risk to the hazards of ammonia exposure. Dehydration. Is the result of ammonia's great attraction for water. Anhydrous ammonia will extract water from body tissue. Caustic burning. Is the result of the strong base formed when ammonia combines with water from body tissue. Once ammonia extracts water from body tissue it forms ammonium hydroxide that can chemically burn tissue. Freezing. As liquid ammonia vaporizes it pulls heat away from body tissue causing frostbite in an instant. Released liquid anhydrous ammonia has a temperature of -28°F. Be aware that children are much more vulnerable to ammonia injury because of their larger surface area to body weight ratio. Also, a child's respiratory system will suffer the affects of ammonia exposure more so than an adult because children have a greater lung surface area relative to their body weight. Eye Contact: The extent of eye injury is dependent upon the duration of the exposure and concentration of the gas or liquid. Even low air ammonia concentrations can be very irritating to the eyes. Permanent eye damage is not unlikely. Contact lenses should never be worn when working with ammonia. First Aid for Eye Contact: Immediately flush eyes for at least 15 minutes keeping the eyelids open. Remove contact lenses if it can be done safely. Contact emergency management services (EMS). Skin Contact: Ammonia gas may cause skin irritation especially where skin is moist (perspiration). Patients exposed to only ammonia gas and have no skin or eye irritation do not need decontamination. Ammonia liquid will cause extensive skin damage resulting from dehydration, freezing and the corrosive action of ammonium hydroxide. First Aid for Skin Contact: Flush exposed areas thoroughly with water. If clothing is frozen to skin, thaw out area first with water before removing clothing. Clothing then is contaminated with ammonium hydroxide and can cause secondary exposure to responders. Applying water on a patient may cause hypothermia so use blankets and quickly shelter them in a warm and dry environment. Contact EMS. Inhalation: Even at low concentrations ammonia vapor is very irritating to the nose, mouth, throat and lungs. The airway may swell and constrict making respirations difficult for those exposed. Because of a child's narrow airway they are especially susceptible to breathing difficulties if exposed. First Aid for Inhalation: Move the person to fresh air. If breathing has stopped perform artificial respiration and administer oxygen if available. Contact EMS. Ingestion: Ingestion of anhydrous ammonia is rare. Ingestion of the liquid may result in severe irritation or corrosive damage of the mouth, throat and stomach which may be displayed by nausea, vomiting, diarrhea, and in severe cases, collapse, shock and death. Ingestion of ammonia does not normally result in systemic poisoning. First Aid for Ingestion: Give water or milk to drink if the patient is conscious and able to swallow. Telephone for medical advice. Do not make a person vomit, or give activated charcoal, or attempt to neutralize. Contact EMS. Permanent ammonia storage locations are required to have an open container filled with water for emergency use. Each ammonia nurse tank has a water supply designed to provide ready access for flushing any part of the body contacted by ammonia.